An antagonist comes to life on the page. When I’m reading, I really appreciate a nuanced antagonist – not an evil, evil bad guy, but someone who has some depth and dimension. But when I’m writing, I tend to think of protagonists and antagonists in very simple, moralistic terms – I want a good guy and a bad guy, and I tend to enjoy writing over-the-top characters – all head and no real body. Maybe I can excuse myself because I’ve been reading for almost 40 years, but I’ve only been seriously writing for a few. I hope that as I grow as a writer, I’ll be able to incorporate more subtlety and still have the same amount of fun. In class, Jenny Crusie spelled out for my writer mind what I already knew in my reader mind: the protagonist owns the story, and the antagonist shapes the story. You can see her thoughts in her own words on this recent Argh Ink blog post. You would think Halloween’s scary stories would always fall into this kind of good guy/bad guy pattern, but if you look closely, they don’t. In the first post of my Halloween series, I mentioned “The Raven”. The villain and antagonist there is grief. But an abstract concept makes a sucky antagonist – there’s nothing to push back against. Edgar Allen Poe symbolizes grief with the body of a raven that torments the grieving lover, and this works really well in the short poem. In order to expand this story into a full-length book, though, the Raven would have to get a personality, and expand its vocabulary. No bad guys here – just the inevitable. In the second post of my Halloween series, I provided a link to “The Yellow Ribbon”, the classic horror story about a woman who wears a ribbon around her neck, and her lover who wants her to take it off. Jane is the protagonist – she experiences the biggest change of the story. Johnny is the antagonist, but he is no villain. He’s a loving, inquisitive husband. If there’s a villain of the piece, it’s Johnny’s curiosity – but curiosity can’t be an antagonist. I’ve read books where an abstract concept (for instance “fate”, in Crusie’s novel “Bet Me”) binds together several human antagonists, and it works for me. In order to turn this story into a full-length book, you’d need to give Johnny a driving reason to find out what’s going on. Otherwise, his constant probing would be too annoying. Jane, though, has an excellent reason for not revealing her vulnerable neck. The stakes are life and death for her. This week, I close my mini-series on Halloween with two stories. In another campfire classic, “The Hook” distinguishes quite clearly between a human villain and a human antagonist. The girl in the story is a protagonist who doesn’t change that much. The boy and the madman both play important roles, but the boy is the main thing the girl is fighting against. The madman only provides catalysts for the battle between the girl and the boy, and the girl wins when it turns out she was right to freak out at Lover’s Lane. 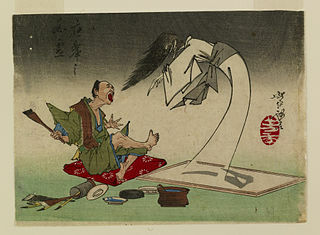 Finally, I want to talk a little bit about Okiku – this is a very old Japanese ghost story, and I couldn’t find a great version of it in English, but this story for ESL students and this Wikipedia article will give you some idea. A lecherous lord pressures a maidservant to be his mistress, but she refuses. He hides one dish out of a set of 10 heirloom plates, and then accuses her of stealing it. He offers her an out: become his mistress and all will be forgiven. She refuses, he kills her in a rage and throws her down the well. But that night, a voice issues from the well . . . counting to nine, and then wailing, “No, it can’t be! Where is it?” All night long, the wailing continues, every night and every night until the lord goes mad and throws himself down the well. The first part is backstory, but important backstory. The maid is the protagonist and the lord is the antagonist. But in the second part, there’s a very nice switcheroo – the maid becomes the antagonist, and forces the lord to change. In both parts of the story, the maid and lord keep their respective roles of good guy and bad guy, respectively. The role of protagonists and antagonists are varied and there are many different nuances. It’s really important to think about this, but ultimately, you have to go with what the Girls in the Basement are giving you. This entry was posted in Character and tagged Antagonist, folklore, genre crossovers, ghost stories, Halloween, horror, Jenny Crusie, protagonist, Romance, villain, writing. Bookmark the permalink. Love the Halloween posts and the scary stories you’re pointing to! I agree with you about needing a nuanced antagonist. I watched an old Western on TV the other day, and the good guy wore a white hat and the bad guys wore black hats. Just to make sure we could tell them apart, I guess. I’m almost sad Halloween is almost a week away — I love the build up! But I’m excited for NaNo in November! I’m trying to make up some easy menus to use during the month, and I’ll be munching on pumpkin seeds for the first week, at least! Maybe my characters should be wearing grey hats (-:. I completely agree that a nuanced antagonist makes for a better story, Michaeline. I think I’ve mentioned before that I adore Dorothy Dunnett’s Lymond Chronicles. Probably my least favorite book out of the six is The Disorderly Knights, because the antagonist is a Very Bad Man and I find him just as you’ve described above – all head and no real body. I’m struggling to make my antagonist, Hawk, more than a one dimensional bad guy. It’s tough, but the story will be so much richer because of it. Jenny said something about how you’ve got to like, or even love, your villains way back in the second class. There are some bad, bad people in the world, but there are few people who are bad to everyone. (-: I will have to check out Dorothy Dunnett, Jilly! I just got a box from Amazon, and am feeling a little guilty about how high my to-be-read (and to-be-watched) pile is getting.